4QD’s Reversing Bell throttle hand control and associated Horn Relay Board are designed to simplify miniature Loco wiring whilst maximising features available. The Reversing Bell throttle gives a dead man speed control and may be used without the additional horn relay board. 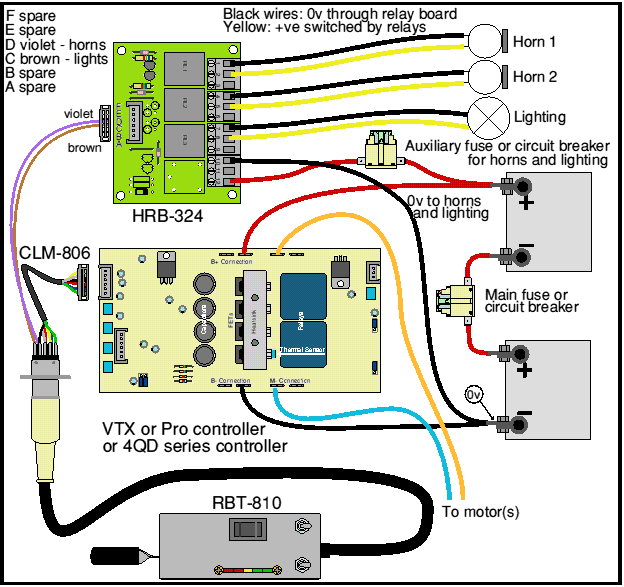 The horn relay board has 2 choices of operating voltage [12V or 24V], but by cutting one track on the board, 12V horns and lighting may be used with a 24V controller. The HRB can have either 3 or 4 relays. There are also a number of links on the PCB that can be broken to allow operation of accessories such as sound cards that must be isolated. See instruction manual for more details. Wiring for a loco could not be simpler. This is the diagram as in the instruction manual. More diagrams are available, see list at end of this page. 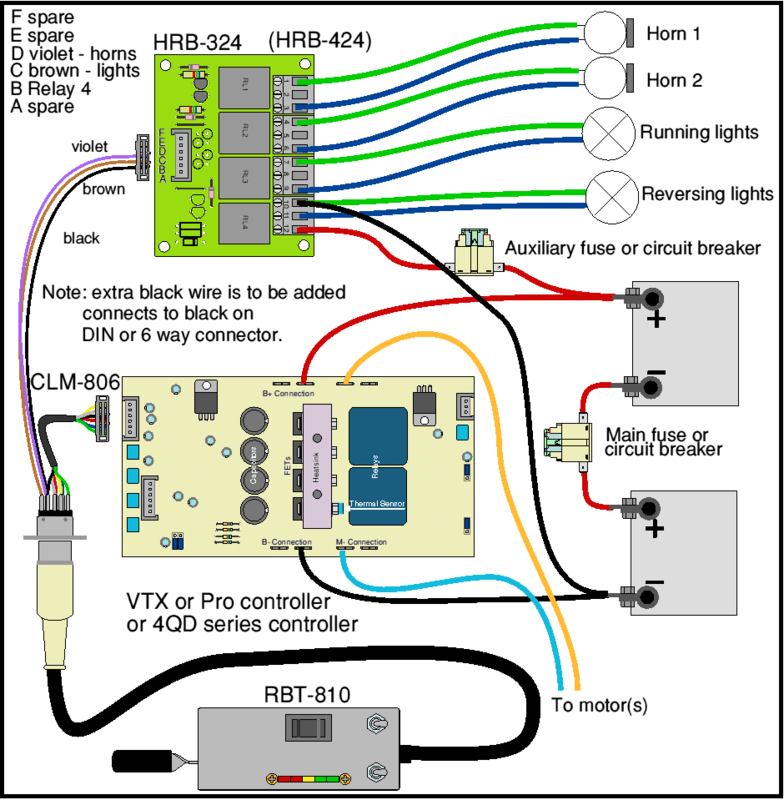 The diagram above shows the wiring for a DNO, Pro, VTX, or NCC controller operating a 24V motor with 24V horns and lighting. To use a 4QD series controller, only the Control lead has to be changed to a CLM-834 instead of the CLM-806. The CLM-834 has one 6 way IDC and one 4 way IDC which plug straight into the sockets on the 4QD series controller. for use with 12v lights and horns using the bottom battery of the 24v pair. 36v operation with 12v lights and horns using the bottom battery of the 36 v set. 24v system with a separate 12v battery for lights and horns. 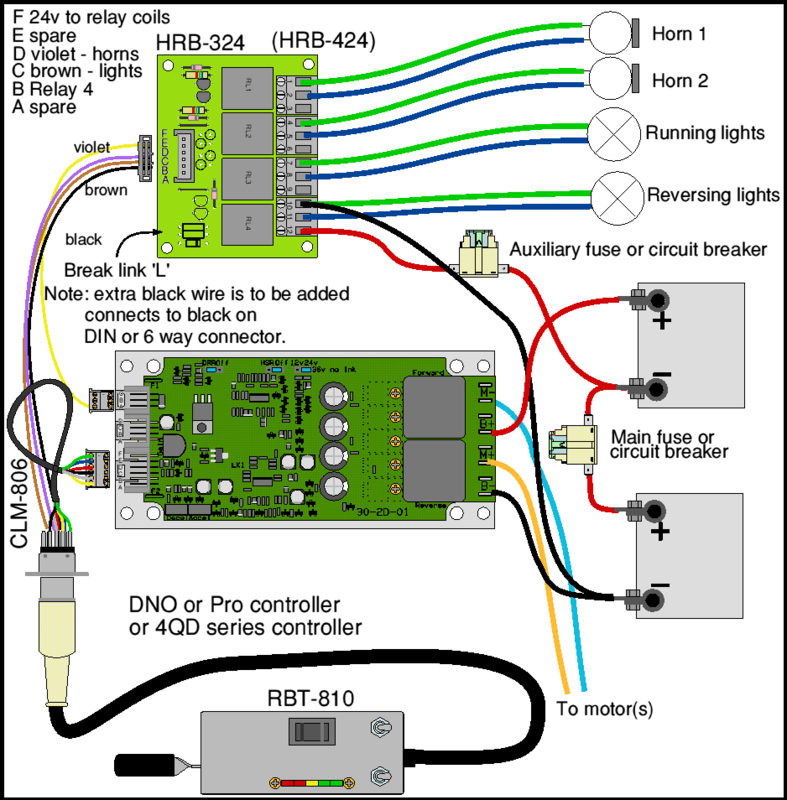 The HRB-424 includes an additional relay which may be use to operate reversing lights, sounder or other equipment. This relay operates when the appropriate input goes high, so for a reversing warning it is connected to the black wire from the reversing switch. Wiring for 4 relay version is shown separately and is not in the instruction manual. The 4th relay is usually operated from the reversing line operated by the reversing switch. It requires +24v (for the 24v version) to operate the relay coil. Wiring for this is shown below. Note that link L (not link K) must be broken. However the screw terminals cannot now be used for the 24v power feed to the relays: this should be fed to pin F of the 6 way connector. It is probably easiest to take this 24v from pin A of the parking brake connector; note that the diagram below shows a DNO, the parking brake connector on the 4QD series is rotated through 180 degrees. Shown in the wiring are two circuit breakers or fuses. These are optional but are recommended in case of wiring faults. One is a battery circuit breaker, the other protects your lighting and horn wiring. See our accessories section. The boxed version of the VTX is supplied with a fuse in the battery line. A fault in the battery wiring can cause a fire risk. The circuit breaker minimises such risk and also serves as a convenient ‘off’ switch to completely disconnect the batteries. It can be in battery positive, battery negative or (as shown here) between the batteries. It should be rated not more than about 50-70% of the controller’s current rating, so 40-50 amps for a VTX-80, 60-80 amps max for Pro-120 and 70-100 amps max for 4QD-150. In most applications a smaller breaker may be used. Similarly, a fault in unprotected horn or lighting wiring can pose a fire risk and a circuit breaker will minimise this. Most applications a 1 amp fuse or breaker will suffice.